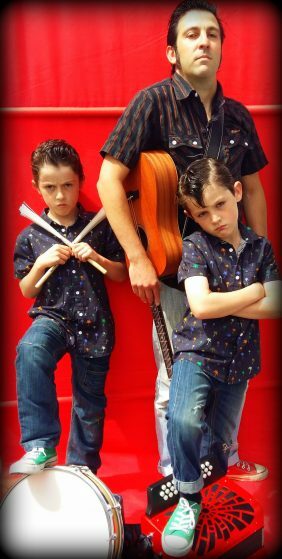 Hailing from the West of Ireland, the Barceló Brothers Trio are a vibrant and exciting band of young Irish lads, made up of two brothers- Séamus (Drums, Rubboard and vocals) and Mícheál (Accordion, Harmonica and vocals), and their father Miquel (Guitar) -an actor and musician who hails from Mallorca. The band, created in their musical and theatrical family home, make music to have fun. They have been sharing their songs and unique festive spirit with the people in their locality since 2015, now reaching out to spread their musical joy across the Irish Sea to North Shropshire! The brothers make a rich musical Gumbo of Zydeco and Blues, with a sprinkling of spicy Rock’n’Roll to keep the party rolling! well-seasoned and ready to dance, the Barceló boys are heading for the Big Weekend 2019!